Card games bring the family together around the table again — especially if it’s raining or dark outside and the kids can’t go outside to play. I also like playing cards because it’s an activity that you can do while seated — so even bedridden or chair-bound kids and adults can participate in the fun! 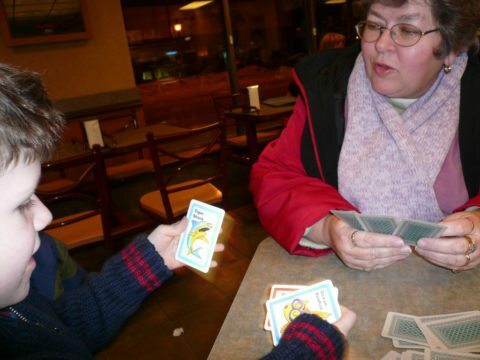 Following are the instructions for playing 3 classic card games that I, personally, grew up with and today’s kids continue to enjoy: Go Fish, Crazy Eights, and Concentration. All you need is 1 standard deck of cards. Any child that knows what numbers look like can play this game. Go Fish uses a standard deck of 52 playing cards, no jokers. If 2 or 3 players are playing, the dealer gives each player 7 cards. If more than 3 are playing, each player gets 5 cards. The remaining cards are spread out in a “pond” in the middle of the table. The goal of the game is to gather cards of the same value. For example, you want to collect all of the sevens, or collect all of the queens. Play begins with the player to the dealer’s immediate left, who can ask any other player about the contents of his or her hand. Note: The requester can only ask about cards that match at least one card they are currently holding. If the player asked has any sevens, they must give them all to the requester and the requester asks the same player for cards of another value. If the player asked does not have any sevens, then the requester is told to “Go Fish” (or draw a card from “the pond”). The requester’s turn is then over. Tip: It can be fun to allow the requester’s turn to continue if he or she draws a matching card from “the fish pond” — in this case, a seven. When any player collects all 4 cards of a particular value, they place those cards face-down on the table. How do you win and keep score? Play continues until any single player has no cards left. The winner is the player with the most sets of 4 on the table. Instead of asking for just a number, you must ask for a specific card (number and suit). You must already hold at least one card of that number in your hand. For example, the requester asks: ‘Do you have the 7♦?’. If the player has it, they give it to the requester and the requester gets another turn. If they don’t have it. they say ‘Go Fish!’ and the requester draws a card from the pond. In the unlikely event that the requester draws the 7♦, they get another turn. If they draw anything else, it is the next player’s turn. When the pond runs out of fish (cards), you carry on playing until all the cards have been made into sets of 4. If the person who is asked for a card doesn’t have it, then the turn just passes to the next player (instead of “going fishing”). When a player runs out of cards, the play does not end — they draw a new hand of 5 cards from the pond (or the whole pond, if fewer than 5 cards remain there). There are various ways of scoring: (1) You may play a series of hands, scoring 1 point for each set of 4 you make. The game continues until someone wins by reaching an agreed target score — for example, 10 points. (2) You may score according to the cards in the sets of 4. For example 2-10 face value, 11 for jacks, 12 for queens, 13 for kings, 15 for aces. Here are some colorful and fun decks of cards for kids. This game is similar to UNO, but it’s played with a regular deck of cards and eights are the only “wild” card. Crazy Eights uses a standard deck of 52 playing cards, no jokers. In a 2-player game, each player is dealt 7 cards. In a 3- or 4-player game, each player gets 5 cards. The remaining cards are placed face-down in a stack in the center of the table. The top card is turned face-up and placed next to the stack. The face-up card is the first card in the discard pile, and the starting point for the game. The goal of the game is to get rid of all of your cards by discarding them according to the rules. For example, if the card on top of the discard pile is the 9♦, then the player to act may discard any 9 or any diamond from their hand. The game is called Crazy Eights because eights are wild and can be played at any time. If an 8 is played, the next player must match the value or suit of the previous card — not the 8. If the player to act does not have any playable cards, they must draw a card from the face-down stack — at which point their turn is over and it’s the next person’s turn. With younger kids, we don’t keep score. If you’d like to keep score, here are the values of each card for scoring in Crazy Eights. Note: If the face-down stack runs out of cards before there is a winner, then the discard pile should be shuffled and reused. Switch up the way players are allowed to draw cards. According to the classic rules, a player can draw a card from the stock even if they have a card in their hand that they can play. Make a rule that says if you have a card you can play in your hand, you must play it. – OR – Make a rule that says if you draw a card from the stock that is a legal card, you can play it immediately instead of waiting for your next turn. -OR- Make a rule that says you can only draw a certain number of cards from the stock during each turn. If you still cannot (or will not) play a card that you have drawn, the turn passes to the next player. Make it harder for a player to put down their last card. Make a rule that says if a player has only one card left, they must alert the other players of that fact. If a player fails to do so, they must draw 2 cards. Make the game more difficult by designating rules for other cards. (Similar to playing UNO.) For example: Designate 4s to be a skip card — so if you play any 2, the next player’s turn gets skipped. Designate all queens to be reverse cards — so if you play any queen, the order of play is reversed. Designate all kings to be draw-two cards — so if you play a king, the next player must draw 2 cards. More details here. You might want to get some card holders — to make holding a bunch of card easier, especially for kids. This is a great game to improve a child’s memory skills, and it is simple enough that almost anyone can play. 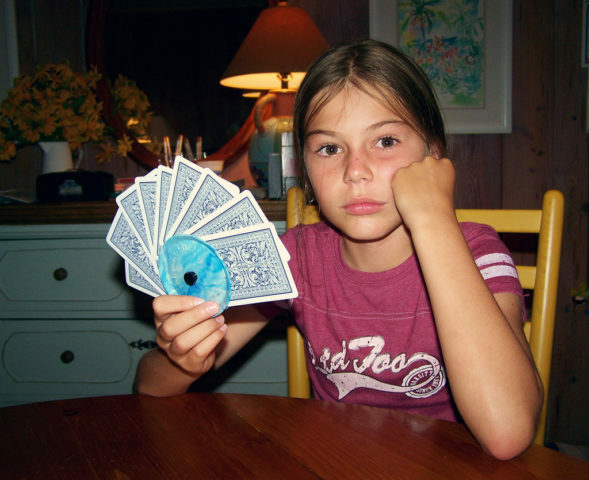 Concentration uses a standard deck of 52 playing cards, but for younger children it may be easier to use fewer cards. The deck should be made up of pairs — so make sure each card in the deck has a match before you start. The goal of the game is to collect the most pairs of matching cards from the deck. Spread out the entire deck of cards on the table, face-down — either haphazardly (which makes the card locations tougher to remember) or in a specific formation (such as a grid, circle, triangle, or pyramid). On their turn, each player, flips 1 card face-up and then attempts to find its match by flipping another card face-up. If the 2 cards flipped up match (are the same value), the player collects the pair and continues playing by trying to find another match. If the 2 cards flipped up do not match (they’re of different values), the 2 cards are flipped back over and that player’s turn is over. When all of the cards are off the table (because they’ve all been matched), the player with the most pairs wins. For a much longer game, use 2 decks of cards and lay out the cards in 8 rows of 13 cards. Pairs must be same number and same suit (10♣ with 10♣).